Don was born in Wangaratta, Victoria. He worked for Karl van de Ven at Olinda Nurseries from 1966-70 and Karl showed him the finer points of hybridizing rhododendrons and started him on a long career of hybridizing and growing his beloved rhododendrons, plus conifers and Japanese maples. In 1994 he filled four shipping con- tainers with his plants and moved to Tasmania, where after a little bit of searching for a site to build a garden he settled at Wilmot, where he established “Lockington” to showcase his many rhododendrons, conifers and ma- ples. Shortly after he made a visit to EVRG and donated an evergreen azalea of his called ‘Beau Bonnie’. 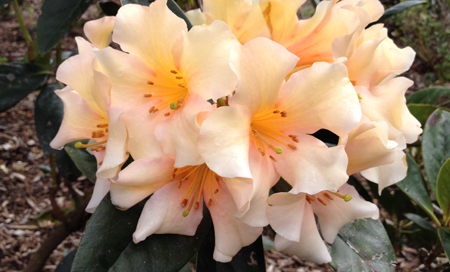 As the years went by Don donated many of his hybrid rhodos to the garden – so we now have a large collection named ‘The Don Dosser Hybrids’. Don’s memory will live on in his collection at Emu Valley.